Featuring quite the colorful website, fullassignmenthelp.co.uk is not your traditional assignment help. At least not according to their website. The company describes its work as ‘unmatched assignment content quality and dedicated writing unit’, which should mean that they are excellent at providing academic assistance. Yet, we found a very small amount of feedback from customers online, which indicates that this company is not as popular as you might think. Richard Compton: The first try with this company was successful, cuz I got a good rate and somewhat good paper. But, I did not get the good discount this time, and interestingly, the paper was half as good as the first one. I guess I won’t be using their services anymore. Timothy Baker: I say no to this company. Fullassignmenthelp.co.uk delivered my paper late, and did not take any responsibility for it. 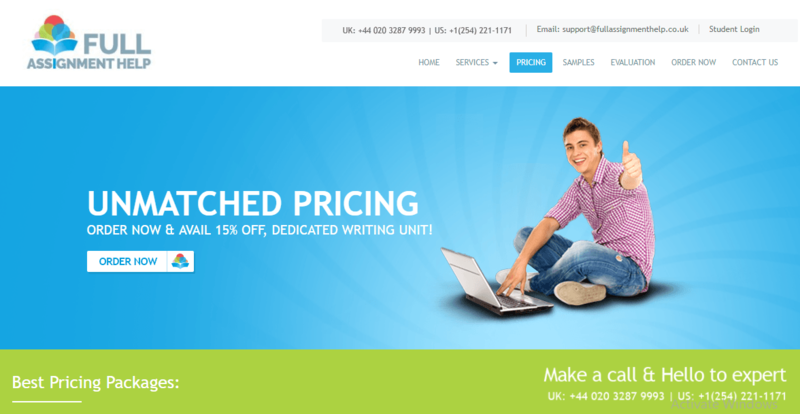 Fullassignmenthelp.co.uk has chosen the right name since they do provide a full list of writing services. You cannot see this list on the website or services page, so we’d recommend looking into the ordering form. If you check this form, you will find that the company offers every paper that comes to mind, plus the option ‘other’ in case your paper is not in their list. This is an excellent sign since students need companies that can assist them with a variety of papers throughout their education. You’d be surprised to hear that instead of prices per page, this company works with packages. Therefore, you can choose one of their three quality options, standard, premium, and platinum, and get the combo of features these combine. Interestingly, these appear as packages but are actually same as every other company offers. The package is the price per page, and the features added are the common benefits of the three quality standards. So, do not be confused – the price list here is same as any other you have seen. The pricing of the company is not high, but not low either. A starting rate is £ 11.50 per page for a deadline of 10 days and lowest quality, ranging up to £ 29.50 per page for the highest quality and a deadline of 24 hours. Unfortunately, this is the shortest offered deadline for this service, which means that you cannot use them if you are fighting very tight deadlines. The only existing discount at this point is the 15% first-time discount. There is no such thing as a loyalty program or bulk discounts, but there are some occasional special offers with discount codes you can add to the ordering form. In addition to this, customers have said that the agents from the customer service sometimes give bulk order discounts if you ask for them, but they are very small. Still, the loyalty program remains non-existent, which is a huge disadvantage for a writing service. The price was significantly reduced due to the mentioned first-order discount, and the paper was of average quality. This was far from the best content we have ever seen, and would not be worth it without the 15% discount added to first order. We ordered a term paper from the company and provided very detailed requirements the writer ignored altogether. Even though there were no mistakes in the content and the formatting was good, this made us decide to request a revision. We asked the writer to follow the requirements this time, but we still got the same paper the second time, with only two minor changes made. The website is a bit too colorful, making it lack some professionalism. But, it is actually very easy to navigate. The content is interesting to read, and finding information is a piece of cake. Perhaps the most disappointing part of this company is the lack of a 24/7 customer service! This is one of the very few services with actual working hours, so finding their agents was a very difficult thing to do. The company has a live chat option, but the agents are offline most of the time. You can leave a message with the customer service, but responses take almost a day. Fullassignmenthelp.co.uk is a legit writing service that delivers content of average quality and charges acceptable prices. However, the lack of a loyalty program makes it a bad choice for a regular provider, while the lack of a good customer support service is one of the biggest disadvantages of writing services.